Boats are boring. Jetski’s are so “nineties” and they get you into heaps of trouble if you go hooning in the wrong place. For real fun – and to turns heads everywhere you go – get yourself into a Hov Pod. Norman Holtzhausen reports. 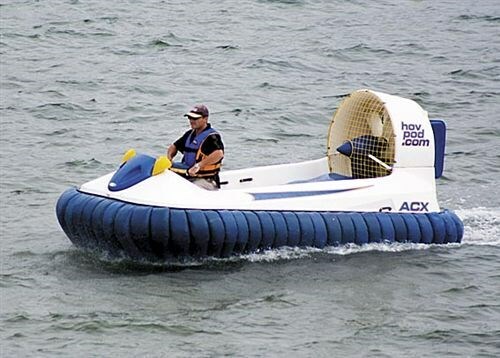 Built along hovercraft principles but with a nod to standard principles of boat design, the Hov Pod is a practical, fun and economical way to literally float on air. 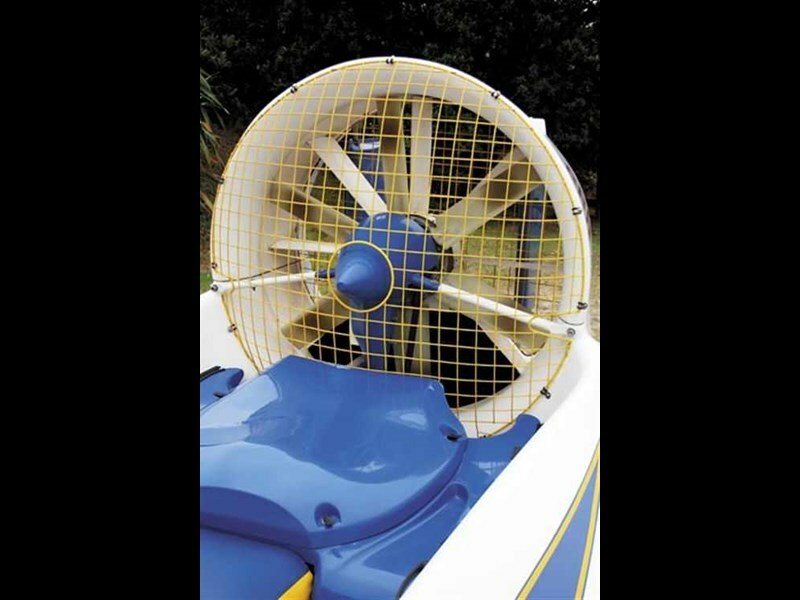 This is truly keep-your-feet-dry boating since you step into the craft on dry land, fire up the engine then gently power away down the beach and onto the water. Once airborne the Hod Pod simply floats over any obstacles on land or water. Over water it can handle surprisingly large waves and swells, and its flat bottom means that any waves which are too big simply cause the whole craft to lift up. 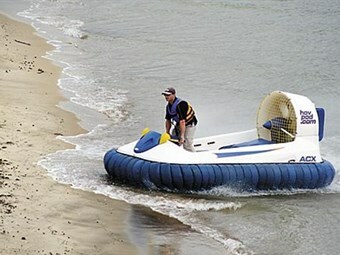 Although this is not the first commercially-built personal hovercraft to reach the market, traditional designs have suffered from a couple of limitations. They tended to be noisy, difficult to control and not particularly fuel-efficient. Their skirts, which wear out over time, can be costly to replace. Hovercraft are also generally quite complex beasts and require specialized maintenance. Furthermore, their usage tends to be limited by weather conditions, especially strong winds. The Hod Pod has enjoyed six years of development to reduce or eliminate many of these problems. The basic craft is built around a laminated composite body, with sandwich-reinforced core for strength in the main load-bearing sections. Positive buoyancy is built into the hull, and it can be safely "settled" in relatively calm water. An emergency paddle and anchor is even provided as standard equipment. 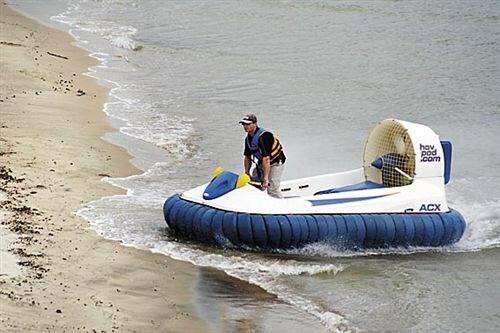 The skirt, which traps the cushion of air under the craft, has been the "letdown" of many traditional hovercraft. The Hov Pod’s tough, Hypalon skirt is made up of a 65 individual sections, and the craft can still fly even with 25 percent of the skirt missing. Each of the sections can be replaced or patched when they wear out, keeping maintenance of this component simple and inexpensive. The drive mechanism has also been kept simple. The engines used are industry-standard, ensuring that maintenance can be carried out by local agents. The smallest model has a 52hp air-cooled Rotax two-stroke engine with a lifting capacity of 250kg. The bigger 65hp water-cooled two-stroke Rotax can lift over 300kg, while the new model with the 91hp four-stroke engine from Moto Guzzi gives better performance (estimated capacity of 400kg), a quieter ride and better fuel economy. All lifting capacities are quoted as a cold start over water – when starting on land their capacity is around 25 percent greater. 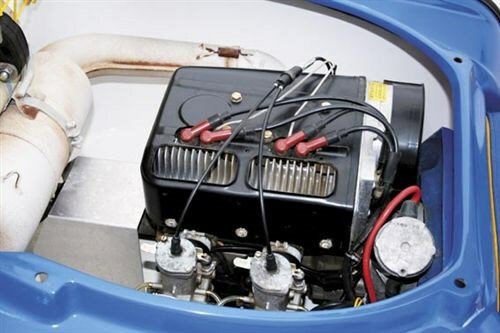 The engine drives a single composite propeller though a toothed rubber direct drive belt. The belt keeps mechanical noise down to a minimum, and the nacelle which encloses the propeller means than wind noise is not a significant factor when flying the Hov Pod. A local agreement with Saona Services provides factory-backed servicing here in New Zealand. The Hov Pod has a claimed top speed of 65km/h, and the complete unit weighs around 250kg (for the two-stroke models). The craft have been tested in up to 35 knot winds, although for most comfort a maximum of 15 knots is recommended. The unit is very economical due to the total lack of friction between the craft and the surface, and the standard 25-litre tote tank will provide up to two hours of fun. An additional fuel tank is available as optional extra. Flying in the Hov Pod is initially a disconcerting experience. Since there is absolutely no contact with the ground, once the craft is airborne it starts to drift in the direction of the prevailing wind. A quick squirt of the throttle and a twist of the handlebars and you are off in the right direction. The ride is unbelievably soft, with none of the crash and roll experienced by a boat going through waves. Steering is similar to a jetski, with a twist throttle and handlebar steering. Unlike other craft, however, you increase the Hov Pod’s throttle when you start to lose control rather than back off. Of course, in the worst case you just throttle right back and the Hov Pod settles gently on the surface. Turning is smooth, with the craft remaining almost perfectly horizontal. Since the turning process does not rely on friction to turn, there are none of the horizontal G-forces experienced on jetskis. On the other hand it is easy to make a mistake and spin like a top, a fault easily remedied with practice. Although training is available from the agents, most people are able to comfortably control the craft within a short period of time. A few hours practice will give full confidence, enabling full 360-degree turns and breach spins. These craft are well capable of wave jumping, and additional skills will develop over time. The noise while "flying" is not uncomfortable, thanks to the custom-fitted two-stage silencer on the motor. Airstream noise is comfortably below that of city traffic, and the entire unit makes far less noise, and less annoying noise to bystanders, than a jetski or other PWC. The ride is reasonably dry, although when flying over a beach there is a fair bit of sand blown up. Goggles are recommended to protect the eyes, although it is really only when doing "donuts" that the grit became a problem. Spray only became a problem again when we tried water donuts, during straight-line riding the passengers remained dry. Interestingly, it was almost impossible to see where we had "driven" over the beach, since the craft has a very soft "footprint". Hov Pod even has a promotional movie showing the craft flying over a tray of eggs without damage. Built by Reaction International Ltd, based in Southampton in the UK, the Hod Pod is now being imported by Hovit NZ Limited. The units are imported fully assembled, with local sales and support (and training if required) provided. Pricing varies according to specification but starts at $28,000. Exact pricing will be given when an order is placed and volume discounts are available.